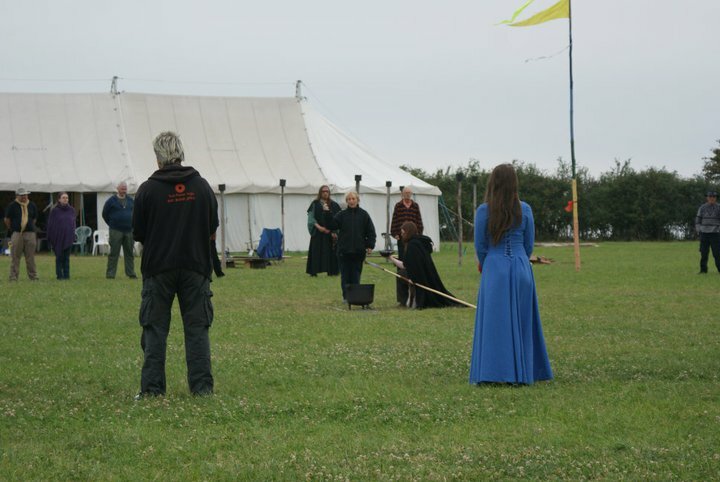 Last weekend, I had the pleasure of attending Pagan Pride in Nottingham. I’ve been there every year since the very beginning ten years ago, and it’s always a joy. I’ve seen it blossom and grow, under the careful tending of hard-working volunteers, a community truly coming together in friendship and shared interests. As is usual, I gave a talk – this time about mental health, and how my Pagan practice helps me to manage it. There were tears, and I felt myself falter several times as I struggled to put words to very amorphous feelings. But I think I helped. The weekend was glorious. Dear friends stayed over, Pride was a full and fun day… but then came the inevitable fallout. I had called in credit on spoons, it seemed, and my inner overdraft had hit its limit. I’m often asked how my life is, on a normal regular day. I suspect some people imagine me rising with the dawn, greeting the sun and then feeding the dogs and cats like some sort of Druid Snow White, before heading to my desk to crank out a novel or two… 😉 Not quite! So. For those who’ve asked, and as a PS to last weekend’s talk… here’s what today has looked like. Today was A Very Bad Day, in terms of health. Mentally, my brain was done. Out of energy. Unable to focus. But still believing that it could, it seemed to be careening all over the inside of my skull like a pinball – or rather, with ideas like multiple pinballs, not letting me catch one for long enough to do much. And then all the balls would fall to earth with the weight of The One Ring. And I would collapse. Physically, this meant I was almost exhausted. Regular fits of tears (today has been a Three-Hankie Day, so far), feeling like an exposed nerve in terms of anything setting me off, headaches, tension, aching joints, having to force myself to eat. Unable to focus, remember? I did call my local Community Mental Health Team at one point, by the way. But my regular (lovely) Doctor wasn’t there. A random CPN was less than helpful. This is the Darkness which I speak of, which I’ve written of. It begins quietly, like a small tug, but quickly becomes an undertow and then a vortex. The easiest metaphor is to ‘ride the waves’, but often it’s just keeping a head above water. Tactics were tried. Knitting was a good one, with a special skein of beautiful, tactile yarn that had been saved for just such an occasion. Tea, of course, and cookies. Amusing podcasts or Youtube clips, to provide friendly voices. Ultimately, however, the blanket fort was needed. Bed, with a book. Books have saved my life so many times. And duvets. Each should come with vouchers to obtain the other. The sun is now setting. I am still here. The window is open, and my little guardian who has stayed by me all day is busy hopping outside and then back in, to check all is well. She slept with me today, but always with an eye cracked if I moved. In case of fuss, you understand. I sit, looking around, and just letting things be. Breathing. The trick is to keep breathing. To find the stillness that I know is here, in these late hours of this day. The tiny magics are the most important, right now. I’m knitting, with yarn from a friendly local shop. A beautiful, simple pattern that will make a portable hug. I’m breathing the fresh air from my garden, combined with sweet incense gifted by a dear friend. I can hear the blackbirds singing. The last few cars heading home. Himself is away, busy with his Knights. I should have been with him, but am hearing stories from those who were there, having fun and sharing their pleasure. Ultimately, I’m being kept afloat by the love and good wishes of others. Through gifts passed on, carefully-made items that make me smile (and often well up, but in a good way this time). Through stories, quick messages of understanding. Chatting to friends miles – and hundreds of miles – away, who get it and who give a virtual hand to hold. Cooking a lovely meal from something Himself prepared a while ago and froze, for just such an occasion as this. I have another event tomorrow. Part of me has been terrified at the prospect. But the louder part, which is now winning, is reminding me who it is that keeps me going. I have friends. I have those who care, and for whom I care in turn. When those ‘brain weasels’ arrive to tell me how useless, awful and unloved I am, I can prove them wrong. As I said last weekend, the tears sometimes have to flow, to let that vileness out. The pressure will ease. I can breathe freely again. And I write. Just to prove that today has not been a total loss. Things had to be moved around, yes, but that was ok. People understand. I’ll see some of those friends tomorrow, and in weeks to come. No doubt there’ll be ebbs and flows of health again, but I am well-armed, by all of you. To those who stand with me, I am so very grateful. Know that I’m with you too. Short and sweet. But it stuck with me. At the end of July, my partner and I took our annual trip to Druid Camp. I realized that I’d been going there for over ten years now, and every single year is different – usually with new things to learn, and experiences that push me forward (often in a quite undignified way). It’s a powerful time, as well as one of great community and friendship. This year’s theme was the Cauldron of Cerridwen, the Tale of Taliesin. 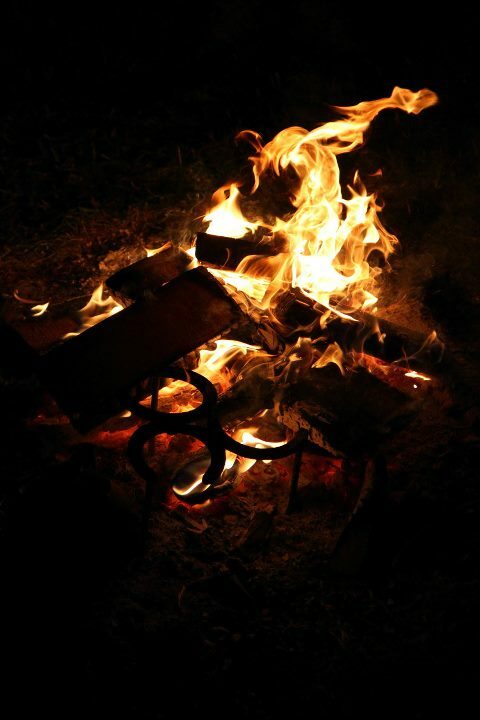 We were there to be inspired, after all, and for the duration of the week, a huge black cauldron was placed in the centre of the Camp, in the ritual circle that we created, into which we would place our offerings – as well as take time to guard it. This latter time became quite a social gathering as people came forward to talk, very much in the presence of the divine brew, words spilling forth and being heard. The rite culminated on Saturday in a great gathering of over 100 people, coming together to work with the Goddess, Cauldron, the Awen and what came forth from it. Every evening, different groups were asked to perform ritual for the Camp as a whole, with my own Hearth undertaking the Friday night. What would be our focus? How would we tie in to this theme of inspiration, as well as facilitate a meaningful ceremony for what could well be quite a number of people of very varied shades of belief? I suggested power. We invite those present to step forward, into the centre of the circle, and tell all present who they are, what they are doing, and what they promise to achieve in the next year – until we meet again at Camp 2012. Including ourselves. And so we did. Around 50 people bravely stepped forward, making their vows, telling their tales, as the energy moved around the circle holding us together. Our community was strong, our inspiration flowed… and we all moved forward. 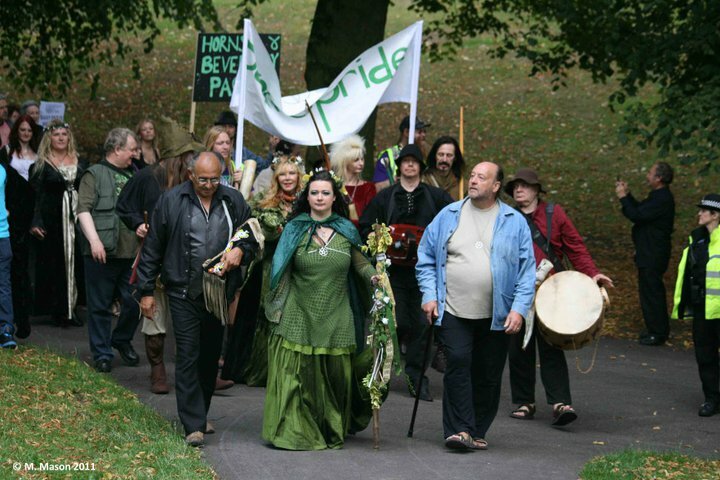 Last weekend was the annual Pagan Pride festival in Nottingham. Over 500 pagans, dressed in their finest, gathered in the centre of a modern Midlands city to march and declare their faith and unity. On a Sunday morning. Just as the shops were opening. On both days, many people stood up publicly and proudly and declared themselves. All ages, all colours, all physical and mental ability. They claimed their own personal power, displayed their bravery in stating their words, proud in their resolve and determination. To quote a Druid phrase, ‘Heart to heart, hand to hand.’ Each time, the energy is tangible, active and potent. Since then, the atmosphere in Britain has changed. Public displays of power are there for all to see: the anger of burning buildings, communities retaliating with brooms. Both groups joining on virtual networks before meeting in person. Everyone has something to say. I sincerely hope that the displays of power that I have experienced this last month have been indicative of a growth in the sense of unity, joined community and like-mindedness. For too long, we have witnessed largely apathy, whingeing and unwillingness to take action. A change is in the air, it seems now, as people are starting to move, realizing the importance of our actions in life, taking a stand for their beliefs. Slowly, there is recognition of greater need for articulation, intelligent debate, asking questions. We stand in our power, here, together. What do we do with it? For more on Pagan Pride, visit organiser Esme Knight’s wonderful blog, or see more pictures c/o the BBC.